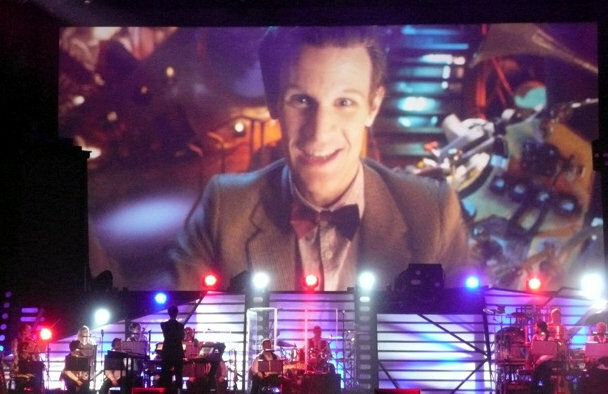 Adam J Purcell reminisces about his visits to Wembley Arena, London, for Doctor Who Live on the 8th and 9th of October 2010. Upper state parameters are in order. Lower state conditions in order. The musicians are functioning admirably. The spectators are in position. Correction, most of the spectators are in position. With great fanfare and exuberant stage acting our host for the evening, Vorgenson, strutted onto the stage and announced to all that tonight's show was “dedicated to one man, one special, special man – the Doctor!” Rapturous cheers and applause went up from the audience. Vorgenson continued, “Wherever you find the Doctor, there you will also find creatures beyond your wildest nightmares! So, hold onto your hats – the monsters are coming!” Again the audience exploded into cheers and that barely seemed to stop for the next hour and a half of this wonderful stage show. A jazzed up version of the current Doctor Who theme pounded out from the live band (no doubt with a little help from a backing track!) as numerous 'monsters' entered the auditorium, made their way through the excited spectators, stopping to menace them occasionally, and filed up a set of stairs in the centre of the stage. They entered a set of slide-open doors at the back of the lower stage, between the band who were split on either side. Above them all, the big screen showed the beginning of the 2010 opening credits and then live images of the monsters amongst the audience. During the explanation of this slightly flimsy but perfectly adequate plot premise we were treated to a wonderful live rendition of Murray Gold's 'All the Strange, Strange Creatures', conducted with great energy by Ben Foster. This is actually the third live production of Doctor Who music I've been lucky enough to see Ben Foster conduct (the other two being the 2008 and 2010 Doctor Who Proms at the Royal Albert Hall) and he always seems lively but during Doctor Who Live he really put that up to 11, no pun intended! I'm not sure if I were more concerned that he might have a heart attack or be taken away to a mental asylum! Jumping around like that is certainly one way to keep fit! In many ways Doctor Who Live was inspired by those hugely successful Doctor Who Proms. The basic formula is very much the same – play a lot of Doctor Who music (all 'New Who', Murray Gold, compositions) and show the audience a lot of the monsters, often up very close indeed. As formulas go, it's definitely a winning one. The children looked like they were really enjoy being so close to the monsters and certainly I, as someone not quite so young anymore, particularly appreciated the incredible live renditions of some of my favourite music. Something for everyone. Obviously Doctor Who Live had an additional element that the Proms did not – a narrative. It was certainly a genius idea to take the Jon Pertwee story 'Carnival of Monsters' as inspiration, so much so that Vorgenson is actually said to be the son of that earlier story's Vorg (Vorgenson, son of Vorg, geddit?!) Naturally that is how he knows of the Doctor and has since become 'his biggest fan', though it was a little less clear how we, as the audience, were supposed to know of our favourite adventurer in Time and Space. Nonetheless it gave the perfect excuse to draw the audience in and make them part of the story. Such fourth wall bending conundrums (compounded when Vorgenson's band continues to enthusiastically play when the monsters inevitably got rather out of hand!) were of even less consequence than the plot itself, however. It was all about having fun and that is what Doctor Who Live supplied in spades! Most of the first half was concerned with Vorgenson doing just what he claimed his purpose to be – to put on a show. After a little mishap with a rogue Scarecrow (from series three's Human Nature) getting loose from the Minimiser, we were then, under rather more controlled circumstances, shown a group of Silurian warriors (series five's The Hungry Earth style) who, again, ventured into the stalls to threaten the kids! Next up was a montage from series five's Victory of the Daleks accompanied by a frankly amazing live arrangement of that story's music by Ben Foster and his band. I know very little about music but I'd call it a 'rock' version of the Victory of the Daleks score, complete with a superb bit of electric guitar work. I really, really, wish they'd release some of this music on CD! We didn't have to wait too long before the Doctor himself got involved in the unfolding story, however. Somehow Vorgenson had kidnapped Winston Churchill (played really well, I thought, live on stage by Nick Briggs) straight from his office on the 6th of June 1944 (D-Day). Wasting little time, Churchill grabbed a mobile phone and, after a bit of figuring out how to use it, phoned the one man he knew he could count on in a situation like that – yes, the Doctor. Obviously Matt Smith couldn't take a month and a half out of filming next year's Doctor Who, so there was no way he could appear live on stage every night as Doctor Who Live toured not only England but also Scotland, Wales and Northern Ireland. Wisely they choose not to recast the Doctor or even fall back on a previous incarnation but instead they had Matt Smith record special scenes for display on the big screen. This did mean that Churchill, and later Vorgenson, would be interacting live with a prerecorded Doctor. Nonetheless it worked surprisingly well and clearly the live actors had managed to rehearse their timings and inflections to perfection. Vorgenson returned to the stage as Winston Churchill sank down into it, presumably another way into the Minimiser beyond those doors in the middle of the lower stage. The Doctor had assured Churchill, and us in the audience, that he was on his way to sort this mess out. Vorgenson twiddled with his metaphorical evil moustache as he admitted to us his true plan all along was to draw the Doctor to him – he is the Doctor's biggest fan, after all. Judoon were next brought out of the Minimiser by Vorgenson, to catalogue the audience just in case the Doctor had been sneaky and gone back in time to be amongst us. Again it was a very crowd pleasing interaction. I was lucky enough to attend the opening night of Doctor Who Live, as did Matt Smith himself. 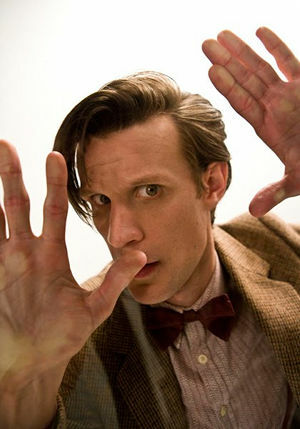 Oddly the Judoon failed to mistake Matt Smith for the Doctor! Vorgenson had to excuse himself for a few minutes, something about having to “cross terminate the manifold curve transmitter”, don't we all! This gave the Doctor a chance to sneak back onto the big screen and tell us to be ready to shout 'Geronimo' when he asks us to – something to do with him priming the TARDIS to appear when several thousand people shout as such. A little girl front of us, probably eight or nine years old, clung onto her mother and hid under a coat for the next sequence. It was incredibly effective. It was the Weeping Angels. Several people have said that they think the Weeping Angels segment was the most effective of all. It is hard to disagree with them. Four policeman entered the stalls from the back, one with a loudhailer telling us to stay seated as they are investigating 'an emergency'. Making their way towards the stage we notice that two statues had appeared on the upper level. Very familiar looking statues. Wonderful tension is built, thanks in large part to the unnerving background music from the band, as two of the policemen make their way to the upper level. “It's alright, it's just a statue, sarge...” Suddenly a blinding flash of light totally obscures the stage and the two policemen by the statues are gone! The statues had also changed poses... The entire audience jumped, gasped, laughed and then clapped as we all realised just what had happened. The clapping quickly subsided, though, as the band ramped up the tension and one of the remaining two policemen, sounding rather panicked, rushed to where his colleagues had been seconds before. Another blinding flash. Another policeman sent to goodness knows when. One left. The police sergeant desperately tried to get through to his station on the radio but hears nothing but static. His fate is also sealed as he gets within touching distance of the Weeping Angels. Flash! Gone. All the while on the big screen the image of 'Angel Bob', at first serene and covering its face but with every flash it too moved until right at the end we see that final feral image that Amy Pond knows so well! 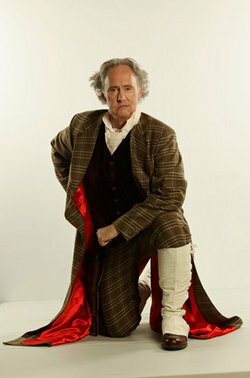 On the big screen the Doctor returned to confront Vorgenson. “This has gone too far. People have died.” before declaring “This ends now.” Vorgenson retorts “I don't think so!” and before we know it the Doctor himself is trapped in the Minimiser. “Welcome to my collection, Doctor! My prize specimen” Fittingly the first half of Doctor Who Live finishes on a cliffhanger as the Doctor declares to Vorgenson “Listen to me, there is someone else behind this! Do you hear me? THERE IS SOMEONE ELSE BEHIND THIS!” Cue closing credits music! After the obligatory twenty minute intermission, Vorgenson was rightly booed as he returned to the stage. To mollify us he sends the rather comely Saturnyne Vampires (aka the Vampires of Venice) into the audience and then the Clockwork Robots (S2's The Girl in the Fireplace). As the Doctor was refusing to appear at the 'window' (for want of a better word) of his cell in the Minimiser, Vorgenson decided to provoke a reaction by reminding him of one of his mistakes – Vorgenson brought out some Smilers and Winders from Starship UK (S5's The Beast Below). Liz Ten quickly joined them, running around shooting the Smilers, protecting the audience from the fearsome automatons. It was exhausting just watching her run around the aisles like that! Finally we had a reference to Amy with a segment devoted entirely to her, basically a clip show on the big screen with the band playing Amy's Theme. Sadly, for whatever reason, Karen Gillan hadn't recorded any special footage and the special bits done by Matt Smith made no reference to Amy or Rory. Nonetheless, it was good to see she wasn't forgotten entirely. This would also be a good moment to talk about the choir. In this case just a soloist was used but in many other instances a good half dozen choir members would walk across the stage, singing. It was very well done, with them in their long robes looking almost ethereal. Finally the Doctor did appear before Vorgenson and asked him a simple question - “Your great invention, all of this, how did it come to you?” and Vorgenson replied “In a dream! A wonderful dream!” The Doctor wasn't buying it – somebody put this dream into his head. Somebody or something wanted Vorgenson to capture the Doctor... All this was to a wonderfully spooky rendition of This is Gallifrey. The Doctor went away again, just what was he doing in there? Vorgenson continued his self styled Greatest Show in the Galaxy by bringing forth the Cybermen. This time not only did they mingle amongst us in the crowd but they even dragged one poor stooge onto the stage to be 'upgraded' to cyberform. Of course we were spared the horror of the actor having his brain removed on the stage, instead he was forced through the Minimiser door and a few seconds later a new Cyberman emerged! No sooner had Vorgenson tricked all the Cybermen into returning to the Minimiser than someone else turned up. Someone who wasn't part of Vorgenson's show. A fabulously electric guitar heavy rendition of the latest Dalek theme ushered the 'new paradigm' style Daleks onto the stage. The puzzle was solved, they claimed Vorgenson was part of the Dalek Masterplan (there were many such names of old Doctor Who stories dropped into the script!) Vorgenson fled from the stage as four of the five new style Daleks appeared from the side, only the white 'Supreme' Dalek being absent. “Activate containment field. Bring the Doctor from the Minimiser” ordered one of the Daleks to another. This was an interesting problem. From the beginning I had the feeling that they'd need to get the Doctor off the screen and onto the stage at some point but how could they – Matt Smith wasn't there (first night, as an audience member like the rest of us, aside that is). The solution was very clever indeed. It is back to that familiar looking box shape in the darkened left hand side of the upper stage. I assumed it would be revealed to be the TARDIS at some point, either having been there all along or somehow lit to make it look like it was materialising there. That was part of the truth but I was underestimating them somewhat. That dark, roughly Police Box shaped, box had two sides facing the audience. They suddenly lit up white and the Doctor appeared within the box. They'd filmed Matt Smith from two angles and projected one to each side of this box – he was trapped in what he called a 'vortex containment field'. For no adequately explained reason, other than it was a very crowd pleasing sequence, we were then shown a montage of the Doctor's regenerations on the big screen, with a great haunting piece of music. During this the containment field turned a slightly opaque red, with the Doctor little more than a dark shadow within, obviously a neat way to avoid too many synchronisation problems. Then it was time for the Doctor to be exterminated. Now nothing could stop the Destiny of the Daleks (yes, really, one of them said that!) Except, what's this? Of course the Doctor knew it was a trap and momentarily disabled the Daleks' weapons as he released the Cybermen from the Minimiser to do battle with them. A pyrotechnic extravaganza ensued! Laser beams cut through the smoke, great blasts of flame emanated from the front of the stage and, in one particularly spectacular case, the chest of a Cyberman erupted out like a fountain firework as it fell to the ground (the falling itself probably not an easy or painless stunt in those suits!) This time the Cybermen weren't as helpless as the last time they did battle – now they had anti-Dalekanium guns! The Daleks tried to withdraw but both they and the Cybermen were drawn into the Minimiser. That was basically that. The Doctor revealed that it was always part of his plan to get drawn into the Minimiser, something about only being able to take control of it from within. Vorgenson returned to the stage to beg the Doctor for mercy and, of course, the Doctor agreed to send him home, along with all of the creatures trapped in the Minimiser – except the Daleks, they'd be trapped forever. Except, what the..! It was the white Dalek, the supreme, the one missing from the earlier line up. Impossibly flying way above the stage. The Doctor was still trapped in the containment field – a sitting duck. “Remember what I told you to do? Shout really loud – Geronimo!” Before our very eyes the TARDIS materialised around the containment field and shot a green laser beam from its lamp, hitting the Dalek. A great plume of smoke gushed from the underside of the flying Dalek and it retreated off around the back of the stage, presumably to its ship. The door of the TARDIS opened and the Doctor waved goodbye. Cue some extended length and very upbeat end credit music! What a show! Standing ovations greeted the cast filing back on stage as the band played an instrumental version 'My Angel Put The Devil In Me' from Daleks in Manhattan (and The End of Time pt 2). Everybody seemed to love it. I was lucky enough to see it not only on its opening night but also again a day later and I am so glad I did get to see it twice, the temptation to watch it again was almost overwhelming, only the combined factors of time and finances prevented me. With prices ranging from about £30 to £50 a ticket (including the booking fee), this was not a cheap prospect, especially for families. Realistically a family of four would be looking at somewhere around £200-£250, all told, which is no small sum. Nonetheless on both performances I attended, the 12,500 seater Wembley Arena was about 95% full and I can't imagine many of those people went home feeling short changed, I know I didn't. A special acknowledgement must go to Nigel Planer who did such a great job playing Vorgenson. In many ways this was a one man show. Yes, he had a very brief bit a dialogue with Nick Briggs, as both Churchill and then as the Daleks. Other than that the only other person he really interacted with was a prerecorded Matt Smith as the Doctor. This show absolutely lived or died based on how well Planer worked us, the audience. Vorgenson needed to be a showman and Planer was unquestionably a great one. Back in 1989 I was also fortunate enough to see Doctor Who: The Ultimate Adventure twice (initially at its opening venue with Jon Pertwee as the Doctor and then later in the run when Colin Baker had taken over). 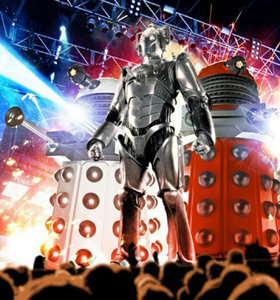 That too had laser effects, pyrotechnics, a big screen, Daleks and Cybermen. Despite having a (slightly) fuller plot and a real life Doctor on stage somehow that felt like a smaller affair, even slightly amateur by comparison to the spectacle that was Doctor Who Live. Okay Wimbledon Theatre has a capacity of about 1,500 compared to Wembley Arena's 12,500 and I can only imagine how many times bigger the custom built Doctor Who Live stage was compared to the limited one at Wimbledon Theatre. There's more to it than that though – Doctor Who Live was bigger, louder, brasher and, frankly, better able to excite, surprise and entertain. 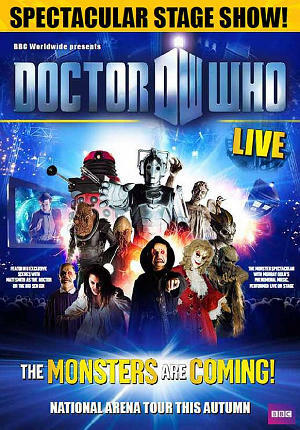 No Victorian or Edwardian era theatre could hope to contain Doctor Who Live, this was an unabashed Arena tour of the likes normally reserved for big name popular beat groups and not for the likes of us and our silly little Saturday teatime TV programme. Doctor Who Live was an utter triumph and I pay tribute to everyone who helped bring it to life so perfectly. It was great to see that the majority of the audience appeared to be young families and in a way I envy those children, we didn't have anything like this when I was their age but, you know what, for those two hours I was a little boy again. The combination of Ben Foster and his musician's live orchestrations of Murray Gold's music, the fun of the monsters scaring the young audience members, Matt Smith and especially Nigel Planer's superb performances made Doctor Who Live an unforgettable experience. Let's hope they bring it back or do another Doctor Who Live soon. Oh, and where's my CD or DVD of it?! Yes, there are clips on YouTube and bootleg audios floating around but they can't evoke the sheer joy of being there, being part of Doctor Who Live: The Monsters are Coming.